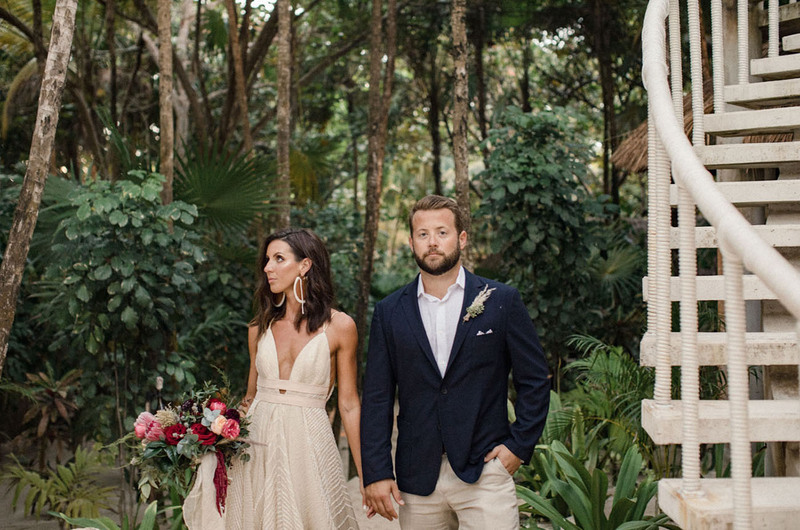 Marina + Erik had so many different wedding plans during their engagement—they talked about Italy, New York, California, and Greece. But they decided they really needed to sit down one night and figure out what were the most important things to the both of them. 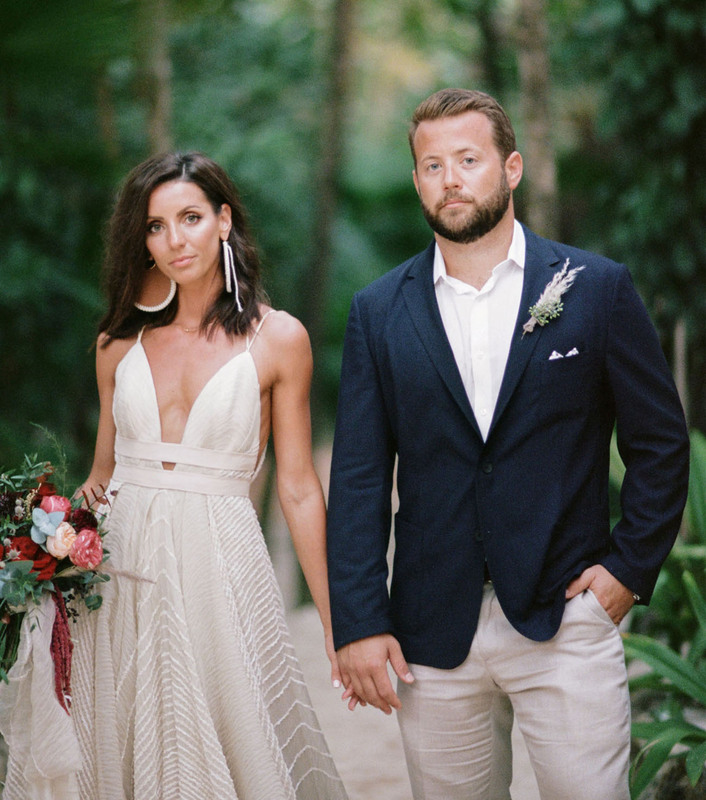 Marina tells us: We are far from our families and closest friends, so being able to spend time with everyone was at the top of our list, along with being able to experience “our day” for as long as possible. 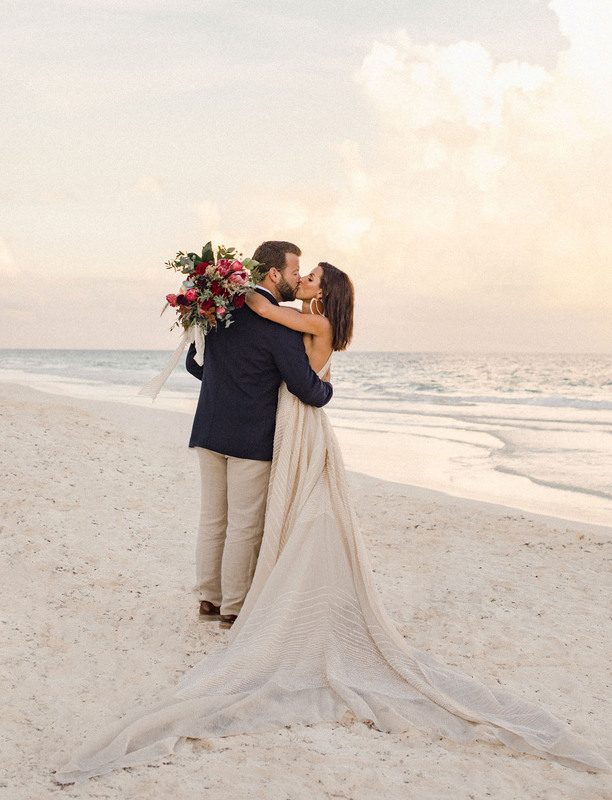 We realized this might be the only time we could request that everyone we love go on vacation with us. A vacation with EVERYONE we love! Being from different coasts, we needed to find a middle ground between CA and NY. 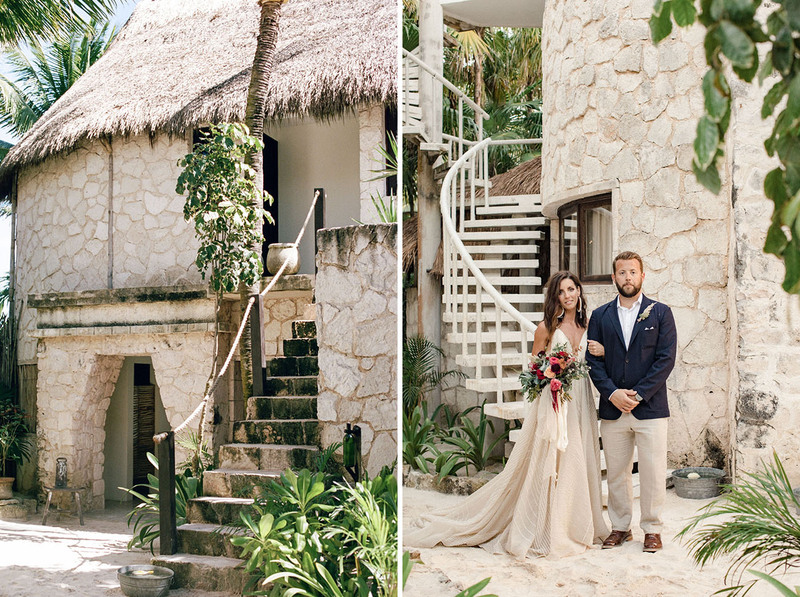 Everyone loves Mexico, and we love Tulum. So there you have it, folks! 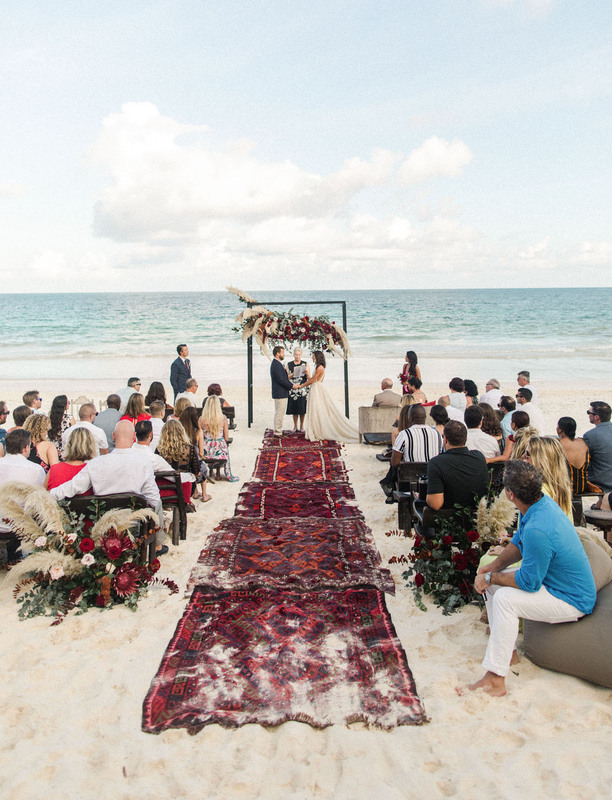 The consensus was to surround themselves with everyone they love for a glorious vacation in Mexico. Sounds pretty good, doesn’t it? 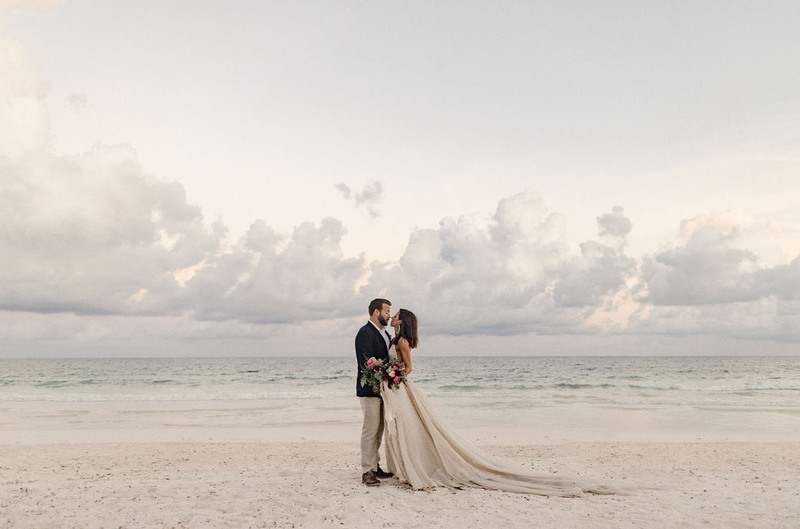 Forget the winter blues, let’s head to The Nest in Tulum and explore the beach in all the photos BrittRene Photo captured! 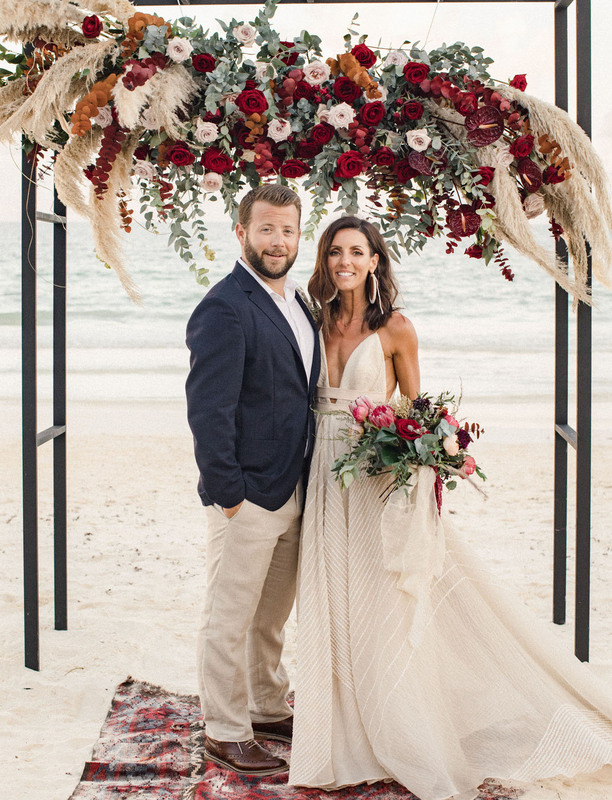 M+E chose a luxurious burgundy and cream palette for their beach wedding—a sort of spin on a modern winter palette, which is pretty fun for the setting. Don’t you think? 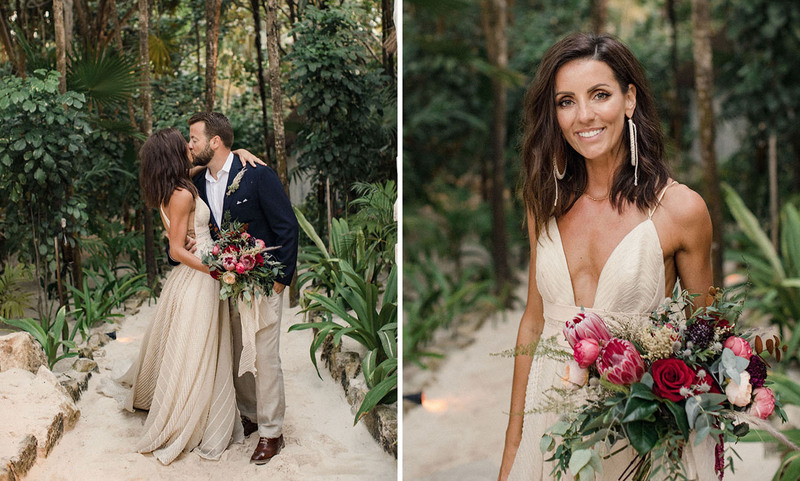 Isn’t that textured Carol Hannah gown a DREAM?! 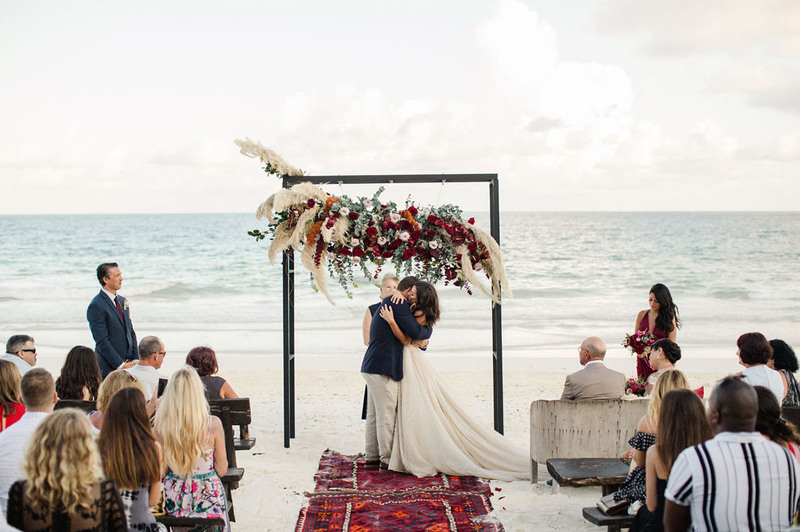 You probably already know how much we ADORE pampas grass…plus rugs down the aisle! 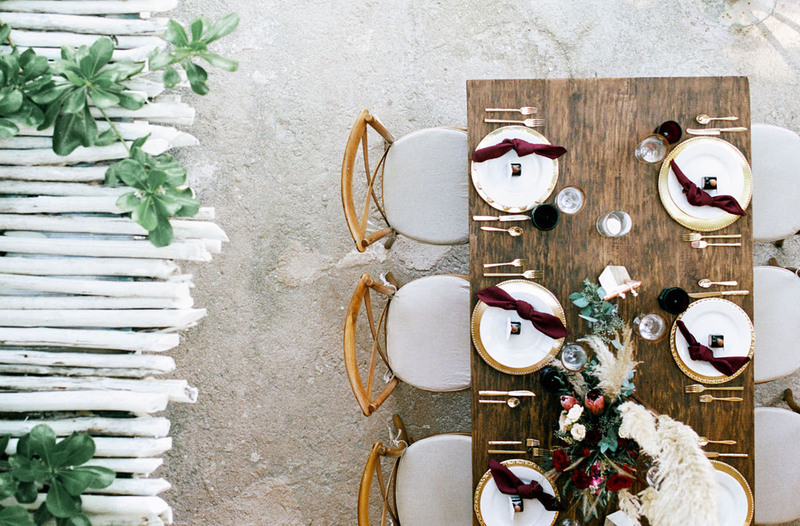 This is such a luxe yet relaxed bohemian look and we wouldn’t change a thing about it. Marina: The moment before walking down the aisle. There was this surge of adrenaline and nerves that I’ve never felt. I was with my parents, about to see and be seen by my husband, and witnessing all the hard work that went into this day. It was butterflies!! 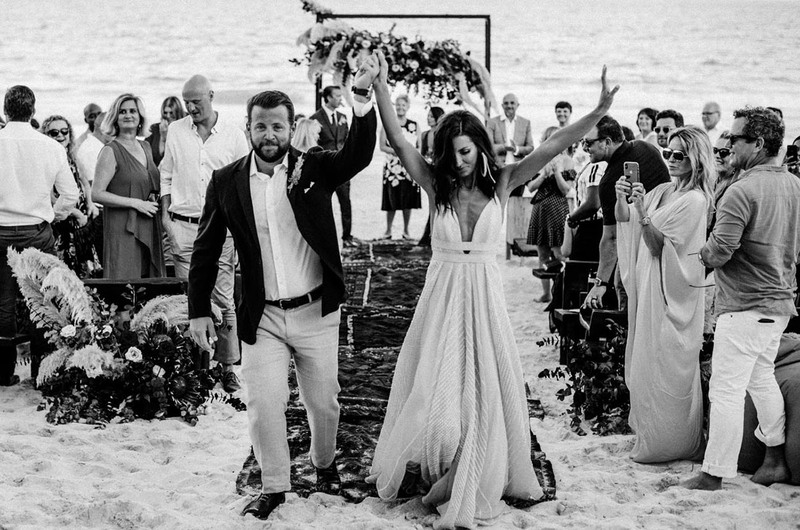 Erik: It was taking the dance party into the ocean! Everyone ran into the ocean, one after another. Clothing optional! 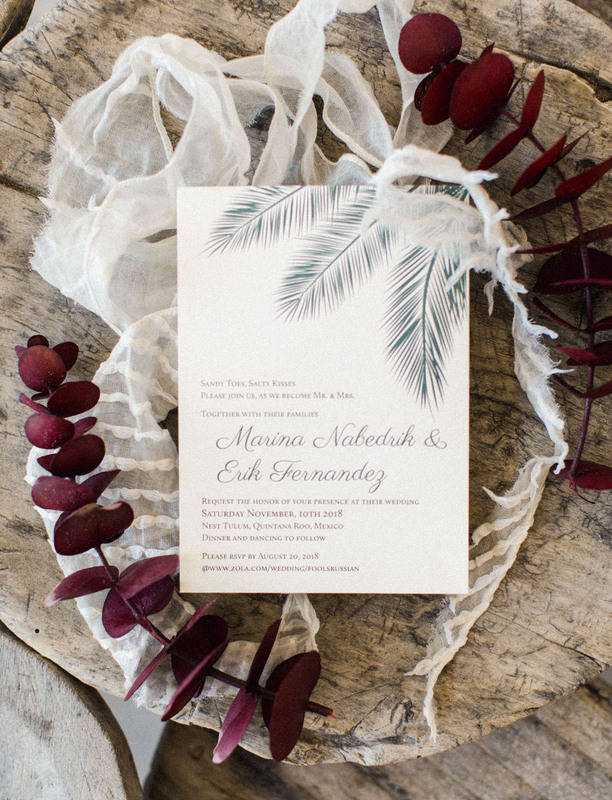 We didn’t want to take away from the majestic natural beauty around us, so we played it down with the colors with a bold pop of a winter red/burgundy hue. 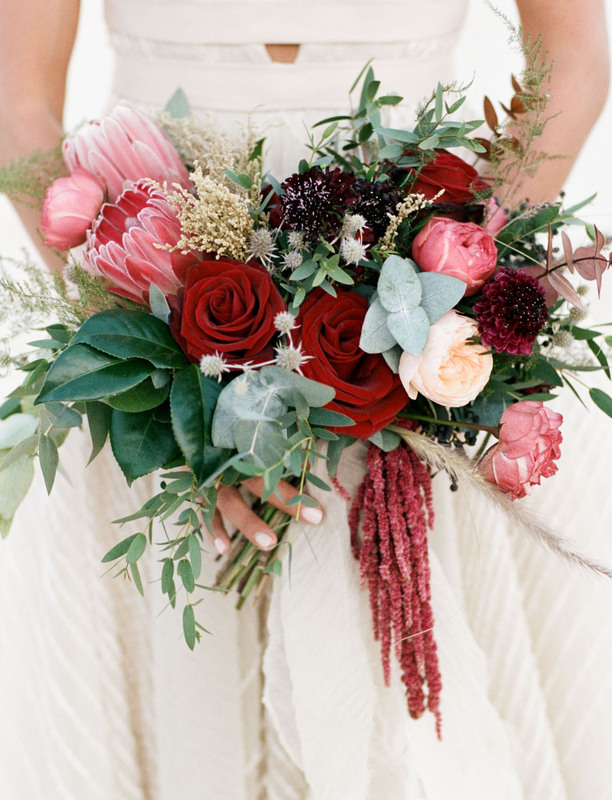 Pink proteas, plump red roses, a touch of thistle, and hanging amaranthus…how gorgeous is this bouquet? I was on a trip with to Italy with my friends. We were in Rome the last few days of the trip and were coming home from dinner, when Erik asked me go pick up a package he sent to a restaurant near our Airbnb (he said that was the closest place he could find to deliver this package). After some initial hesitation, I dragged my friends to the restaurant down the road. I asked one of the waiters if there was a package waiting for me, he smiled and told me to follow him. I followed him outside, and saw Erik with a glass of Scotch, peeking behind a huge tree that was in the middle of the restaurant. I’m not sure why I started to cry, but it was not because the thought of an engagement crossed my mind. I didn’t even think about that. I just thought, “Oh my God, another incredible grand gesture!” (He’s very good at those). After a drink, my friends went back to our place and Erik and I took a walk. We ended up at this empty square, with a grand old building behind us. He started saying all these sweet things and then I turned around to see him on one knee with this beautiful ring! 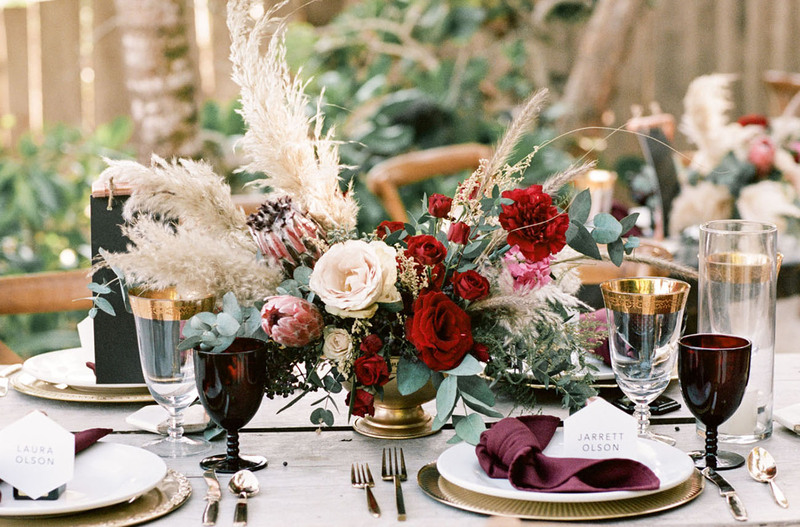 While the temps might not have reflected the typical winter ones, that didn’t mean they couldn’t style the table like so! 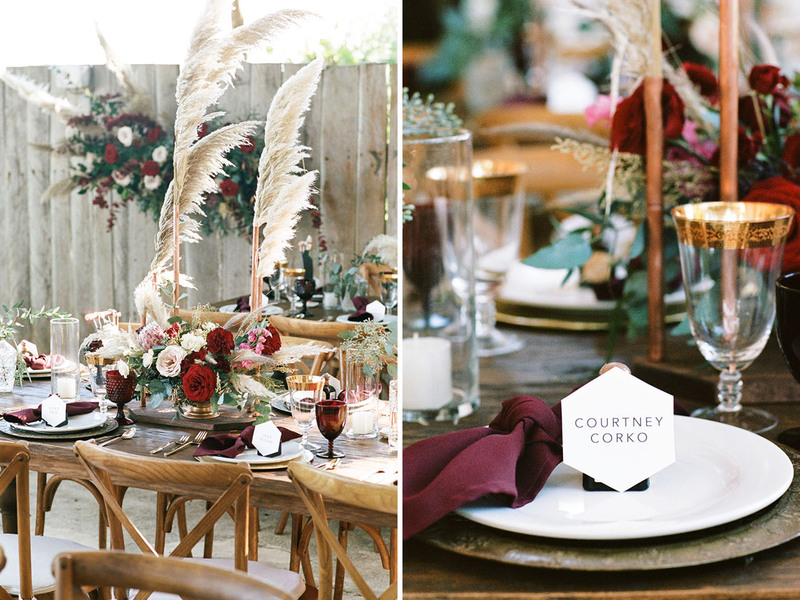 We are HERE for the copper detailing and gold accents with those pops of burgundy. 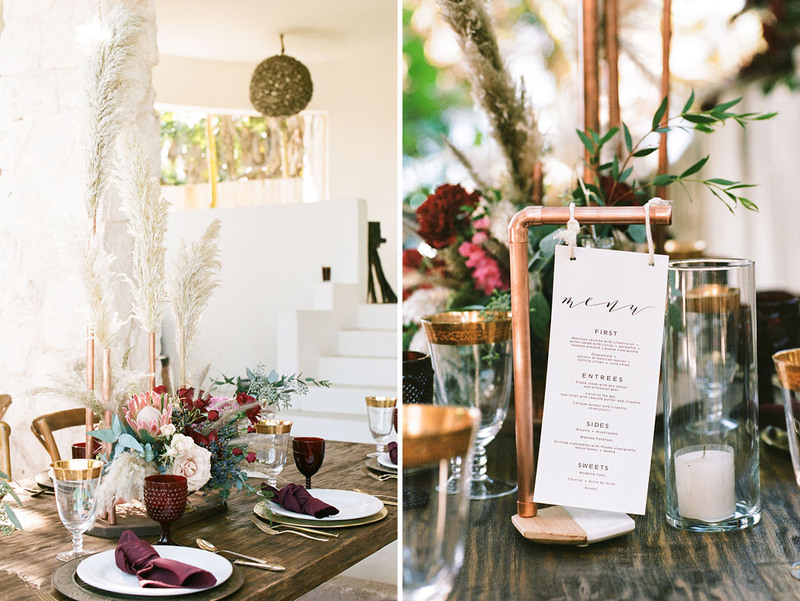 So luxe, so cool, so crisp! That copper tubing was a DIY. Dig the look? Let us know in the comments if we should make a tutorial on how to create something similar! Do not get caught up in little details! No on notices it but you. Make a list of what’s most important to the both of you and focus on that first. How’s that for a “winter” romance? Cheers to the two of you! 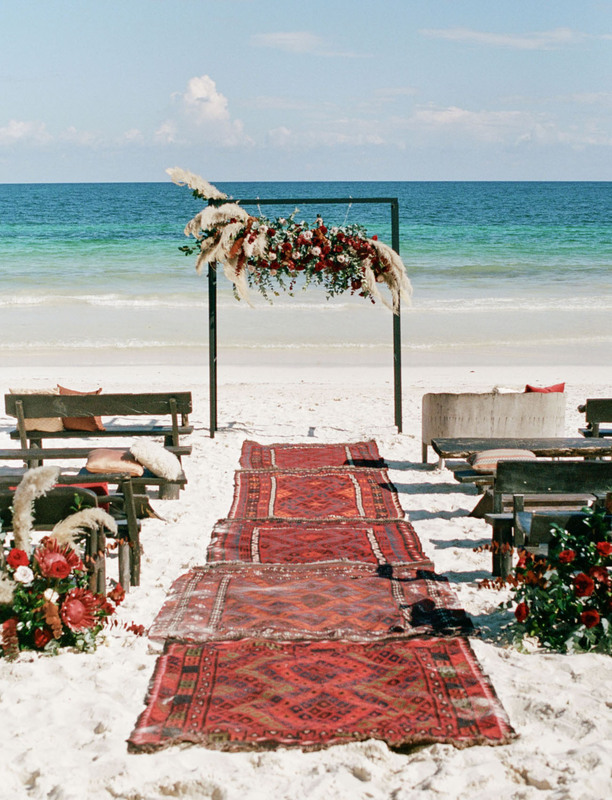 Wow talk about a gorgeous location for a wedding ! 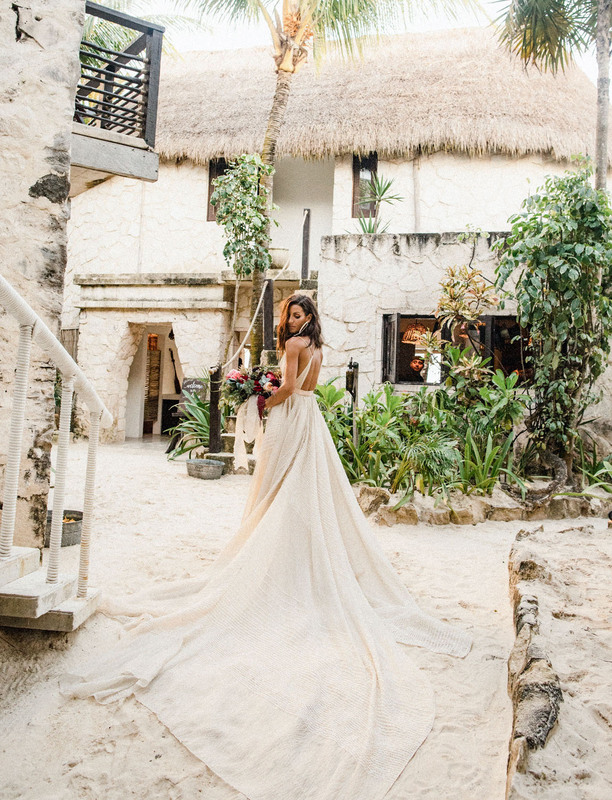 This is an absolutely stunning location. Love it.